What message does this picture send? TPTB are obliged by their own Code of Conduct to tell the ”general sheeplic” what is intended. The picture features black & white which represents the duality of this world. CamerAb has one foot in each sector. The raised one is above the black however and one can only hope that this is similar to what someone on Guardian cif yesterday hoped for when seeing that pic of him on that pallet – that a sinkhole suddenly opens up underneath it. Middle of the Road? Only 2 people. WT15 AAY? Dead Man Walking? Gideon? Yes GW? Would you mind fetching me that Abacus? Right away GW. BTW down @ WATCOR they are ”mad as hornets” about Cameron’s use of an iconic British photograph to try to boost his lacklustre image. 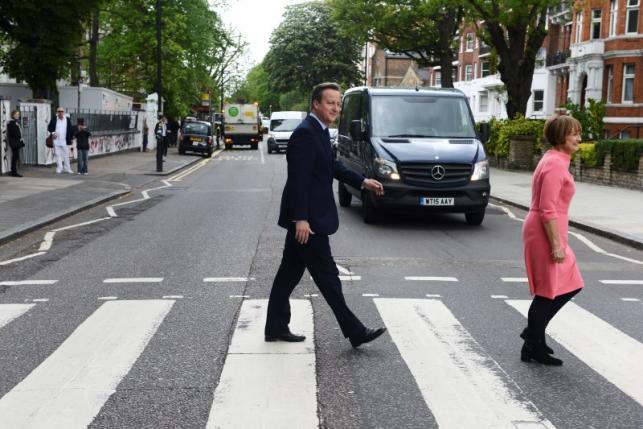 This entry was posted in Uncategorized and tagged Abbey Road & D Cameron: BTW down @ WATCOR they are ''mad as hornets'' about Cameron's use of an iconic British photograph to try to boost his lacklustre image., “Paul Is Dead” Clues on Abbey Road, Cameron & Abbey road - ''Dead Man Walking'' Symbol, Cameron does Beatles' Abbey Road walk in EU bid, Symbolism on the Beatles’ 'Abbey Road' Album Cover. Bookmark the permalink.